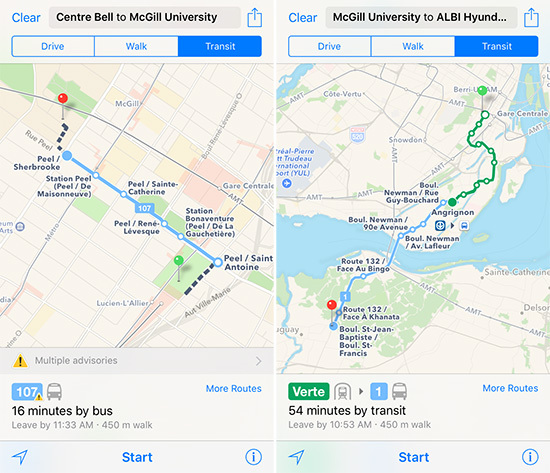 Apple Maps has been updated with all-new transit data in Montréal, providing users with bus, subway, and train routing in Canada's second most populous city. The public transit information is supplied by the city's public transport agencies Agence métropolitaine de transport (AMT) and Société de transport de Montréal (STM). Montreal Metro subway and STM bus directions are available throughout Greater Montreal, including the main island and throughout the suburbs of Blainville, Boucherville, Brossard, Châteauguay, Dollard-des-Ormeaux, Laval, Longueuil, Repentigny, Saint-Jérôme, Saint-Lambert, and Terrebonne. 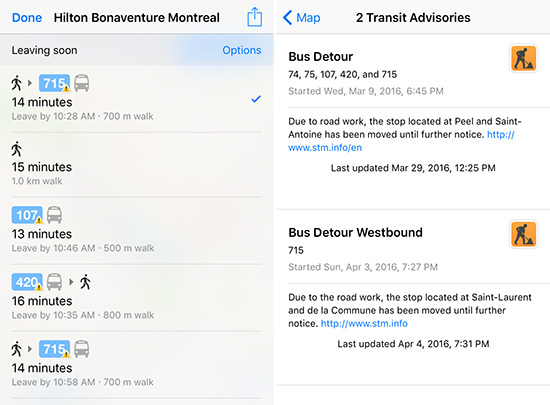 Montreal is the second Canadian metro area to support Apple Maps transit after Toronto. However, as we reported last June, transit data actually extends to many cities throughout Southern Ontario, including Barrie, Mississauga, Oakville, Oshawa, Peterborough, Burlington, Hamilton, Guelph, KWC, York Region, and Niagara Region. Other cities with Apple Maps transit directions include Baltimore, Berlin, Boston, Chicago, London, Los Angeles, Mexico City, New York City, Philadelphia, San Francisco, Sydney, and multiple Chinese metro areas. Transit mode was added to Apple Maps as one of the headline features of iOS 9 last year. That first screenshot perfectly illustrates what's still wrong with Apple Maps and transit directions. I don't want to take transit for the sake of taking transit, I want the fastest way there and sometimes that means walking a few extra blocks and I don't see why I would have to toggle between walking and transit to see that. The third screenshot is where it does exactly what you want. Walking is the 2nd option in the list. I tried the McGill/Centre Bell directions and was given much more direct routes including the 24 minute walk option. Perhaps the article author didn't select the quickest route? This was the case. I had deselected bus routes to get a subway-only screenshot for demonstrative purposes. But I've updated the screenshot now. Who needs Apple maps, when there is Google Maps? GM outperforms on every aspect. When I click on an address in safari or mail, google map does not perform. Just saying. Sorry apple not switching. Google maps layout is better and better informations as well. There are several dozens cities in the Toronto and Montreal regiion (in fact if you look at Toronto coverage, Apple and Google are pretty close in coverage), so in fact they just need to Cover Vancouver, Calgary, Edmonton, Ottawa to get 90% of the public transit in Canada, I expect them to get here by the end of the year. That's not that long since they launched. I wasn't talking about Canada per se, Transit support as a whole. Worldwide. Google Maps covers the entire the Netherlands: trains, metros, trams, busses, regional busses, ferries, etc. from all transit authorities have real time data. Apple: none. Kinda unforgiving in a country where public transportation is responsible for a large chuck of journeys made. They're just now adding Montreal transit? Apple Maps: Always several steps (or transit lines) behind the competition. The only thing Apple Maps has going for it is the tight iOS integration. No wonder Apple refuses to give that up to third party apps because if they did, I suspect substantially fewer people would bother with Apple Maps. Seriously, if Apple announced that they were killing Apple Maps in iOS 10, would very many people be disappointed? There are several apps out there that do various aspects of mapping/routing so much better than Apple Maps and Apple Maps has been around since iOS 6 and still falters at doing basic things like returning relevant results for a POI search. The main problem is that Apple uses the "best user experience" excuse for not allowing integration of 3rd party maps with iOS while those 3rd party apps are vastly superior and support more cities, don't have outdated map data, can take in account real-time bus movement, know where road crossings are, display information in a much better way and have more intuitive and easier UI. So at this rate they're adding one new city per month? Lol.